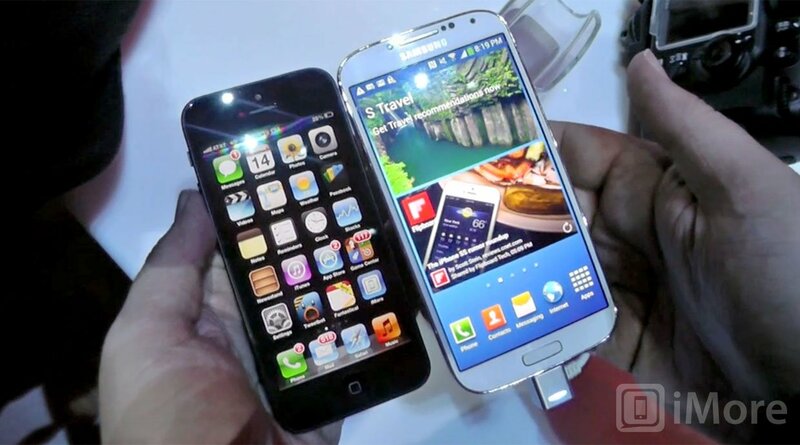 Community spotlight: Thinking about leaving the iPhone for the Galaxy S4? Given how many great phones are coming out these days, it's not wonder one of the hottest topics on the iMore forums is iOS vs. Android, or more specifically, the iPhone vs. the latest and greatest Android phones. Every so often community members start to wonder out loud about jumping ship and trying their hands at Google's mobile platform. Being someone who enjoys new technology myself, I can understand the curiousity, and, of course, the feeling that the grass always greener on the other side. One particularly interesting discussion this week comes from the thread leaving iOS for Android and more specifically, the Samsung Galaxy S4. With the upcoming Samsung Galaxy S4 and the leaked specs coming out, will this be enough for you to want upgrade to the 5S? Or do you believe the S series will be outdated when it finally does arrive as compared to the software and hardware being offered by Samsung? For most smartphone users it's not about which phone has the latest specs or newest OS. It's about what platform gives you the experience. Apple has consistently delivered the best experience for a smartphone, even more so with each subsequent device release. Sure, the new Sammy may have a quad core processor or 12 MP camera, but that doesn't mean it'll outperform the new iPhone. Apple builds their devices for what the OS needs to perform at top speed. Their phones don't need quad core to support the OS. Android phones are getting dual and quad cores and still having lag issues. In the end, it's all about choosing which experience and ecosystem you want. My choice is Apple and will remain that way unless there is a better option. It's not Android, WP, and definitely not BlackBerry 10. Doesn't matter how good the hardware is if the OS lags. Hardware specs mean nothing. It's all about useability. iOS runs like butter, Android lags (it's better with Jellybean, but still not as fluid). I had an HTC One XL, and although the hardware was awesome, Jelly Bean still lagged even though I had it running a custom rom and kernel.... and it was overclocked. I am sticking with Apple. It's absolutely unbelievable [Apple doesn't] have a bigger screened branded iPhone launching this year. Sure, it could come next year but that's an awful long time to concede that space to the competition. A retina plus 4.8" iPhone could make the HTC One or Galaxy S 4 look silly. It would only be a band-aid for what is really hurting Apple but it would be a well placed one that could help give them time or at least right the marketing ship. I find myself becoming bored with my phone within a few months so, I'm constantly bartering and swapping to find my next device. I must say that I have never really been impressed with Samsung phones. I've owned the Galaxy S 2, Note and Galaxy S 3 just to name a few of the many. My largest complaint with all of these devices (and possibly just Android in general) is battery life... I've not owned the iPhone 5 but would like to. I read the posts on here about battery life and wonder if I'll actually see a difference. When it comes to gizmos and gadgets I would have to say that Samsung is really trying to stay ahead of Apple with limited success. Apple and the iPhone are known for their quality of build. Sadly, the same can't be said about the plastic, cheap feel of Samsung phones. Who knows, maybe I'll hold the Galaxy S 4 in my hand and decide it's the perfect device for me! Or maybe not. Personally, I just love new devices and I'm always trying them out, regardless of OS or manufacturer. There are a lot of factors to consider, however. If you live in the Apple ecosystem with your Mac computer, iPad and iPhone, and you're used to using iTunes to manage your media, iMessage to avoid SMS fees with international friends, and you've spent a lot of money on apps and games, Apple has you right where they want you. On the other hand, if you are not heavily invested in Apple products, you can switch around far more easily. Take it from me, if you are considering the switch to a device such as the Samsung Galaxy S4, stop and consider all the pros and cons, and if there are no deal breakers, then by all means give the Galaxy S 4 a chance. It looks to be a powerhouse of a device. If you do have concerns, though, jump into the iMore forums and get into the discussion. We'll help you make the best, most informed descision possible!